In 2001, the titanium PowerBook G4 was released. The design was very... bland... next to the PowerBook G3, and had a wide screen, which I hated at the time. Since 2001, I have waited for another laptop design I would want, purchasing devices I needed while I waited. 2003 was a new release, and the design became more plain. The stylish keyboard with the italicized Futura was replaced with something more ... normal. The clear grey text on the silver backlit keys made seeing the keyboard without the backlight on, or anywhere but a dark room. The MacBook Pro line had some good improvements, but never really in it's design. It seemingly regressed with a lower resolution, larger bezels, and increasingly less friendly ways to upgrade. The newest Retina-screen MacBook Pros, with their thin chassis and new colors are still plain and even more expensive for seemingly backward moving specs (even though its still highly desirable). They finally come with 32Gb of RAM, and USB-C makes them better to use, but it's still rather dull. I'd get by if Lenovo's ran macOS without needing to part waters. Regardless, I wanted a PowerBook G3 for the longest time, and since I had some free time, I was going to make it happen. No more waiting on manufacturers to make my dream laptop: if I wanted it done right (or as much as possible), I needed to do it myself. The shell is a Powerbook G3 of course. 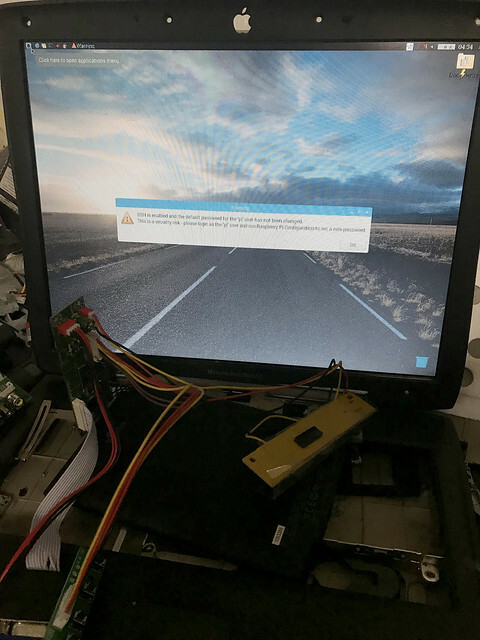 It's powered temporarily by a Raspberry Pi 3 (being replaced with an actual board supporting SSDs, etc later), and the 1024 x 768 PowerBook display was replaced with a 1400 x 1050 LCD removed from an old Dell. I have an 11" display from an X100e (never buy that laptop, its awful) that almost fits in the PowerBook. If I remove the touchpad, it fits perfectly inside, and I can have a touch-keyboard that can be contextual, used as a giant trackpad, and cause the PowerBook to look very much like an old SpyMac photoshop. This one has to wait until I can figure out the LVDS(?) pinouts for the display. The parts in this come from several Dell laptops, Mac Mini, G5 Powermac, and more. There are a few iPhone parts in it at the moment also, where it's used to replace larger components (tact switches, some resisters to replace ones I blew out, etc). This project has the highest reuse of parts, with the only items purchased new being the LCD board, raspberry pi, and the HDMI-VGA adapter. I'm powering it with a 12v 5amp adapter (which blew out the previous video controller, confirming what it was rated for wasn't what it was capable of). Next week or the week after, it should be usable enough to carry around. Depending on how the rest of the year goes, I may replace Glyphs app with FontForge for working with OpenDyslexic, and finally try to move my work over to Linux software.